Andhra Pradesh is known for its flavourful curries and fragrant biryanis. This land of the royals celebrates its culture and rituals to its fullest. There is one such art form that has been nurtured in the state in a city called Pedana, 13 km from the coast of Machilipatnam. On a hot afternoon, we landed in Hyderabad for our connecting flight to Rajahmundry, a city where my mother-in-law was born. After a 20-minute ride in an ATR, we landed in the lush green city. 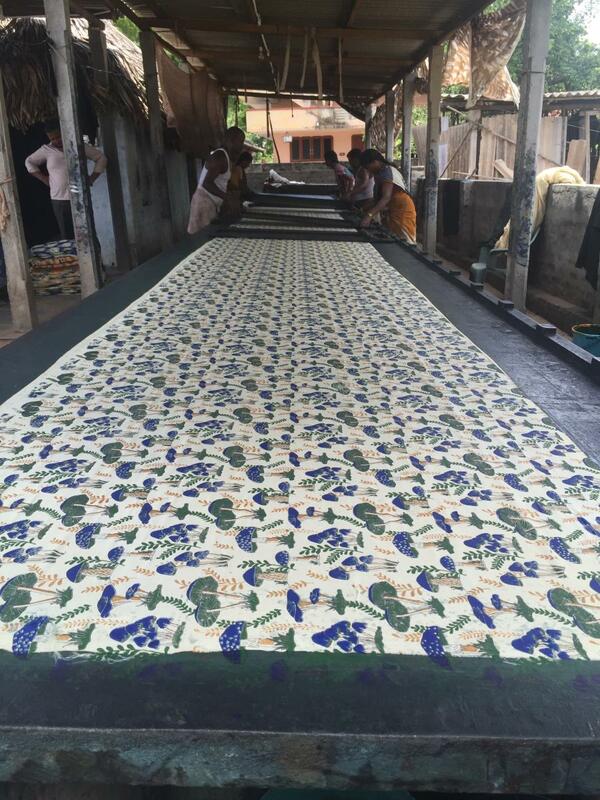 A few random searches on the internet led us to a small town some 200 km away that was famous for its block-printing art called Machilipatnam Kalamkari. At first, I assumed that this would be a huge market crowded with wholesalers. But I was proven wrong within seconds of entering Pedana. Over thousands of artists and their families who live here have created an ecosystem that has managed to keep the Kalamkari art alive. As we walked through the bylanes of Pedana, we spotted the locals engrossed in creating beautiful block prints on fabrics using large screens. The screen-printing units would start off with the lighter shade and the base print of the art. While two of them moved the screen, the other two added colour to the mix. In a matter of minutes, they would finish off a 10-metre cloth and move on to the next one, as another bunch would take it away to the nearby street to dry it off. At times, you will have to hop, skip-and jump through the tiny roads in the village to miss the freshly painted cloth that is drying in the sun. Things got more interesting when we moved towards the household units. There was a group of five women who would work on creating sarees. The process remained the same; they started off with measuring the fabric. As one of them was continually stamping the ends to create a delicate border, the others were filling them up with bright colours. We were informed that it takes about a day to create just about five of these sarees as they need to be flawless to get a buyer. ‘Kalamkari’ means drawing made using a pen. But the style that is followed across Pedana uses carved blocks and is usually called Machilipatnam-style Kalamkari. The art evolved during the Mughal era and the textile created by the families is used as bedsheets, dress materials and most importantly, sarees. These light fabrics and vibrant colours have started gaining popularity among the urban audience owing to their sheer texture, lightweight and prints that are cross-cultural designs. You might not find too many references of religion or deities; it pays an ode to nature. The teakwood blocks, cotton and silk sarees et al are all done in-house, and, while most households practise the art, each of them has a unique design to offer. The base concept and colours mostly remain the same. The fabric produced here is monochromatic, and if multi-coloured, each section is printed using a different block. Most houses here have an open-door policy and you can walk into a house and they will educate you about their art. The distinct brightness is a trademark of Kalamkari and it is made using alum and tamarind seed powder. If there are any other colours used, they too are made using vegetables, flowers or minerals. Just like the printing, making the colour also takes a long time, and needs labour. Thus making the final product such a delight. As for shopping, one can buy the fabric (or a version of it) straight from the in-house units. Their warehouses are stocked with endless designs, but you need to be patient enough to pick the right prints. If you wish to purchase in bulk, you can get the print custom-made with the designers. Apart from the Kalamkari prints, you will also spot handloom sarees being woven on the streets. These, too, can be bought in bulk. As for us, we over-shopped and had to obviously pay an extra baggage fee for the two bags full of drapes.